It is with deep sadness that we record the passing of Peter Heilbron. Peter was an active member of the SAHB who will be much missed by all of us who knew him. His passions, however, went well beyond the automotive – to history, oriental art, music, fishing, golf and more. 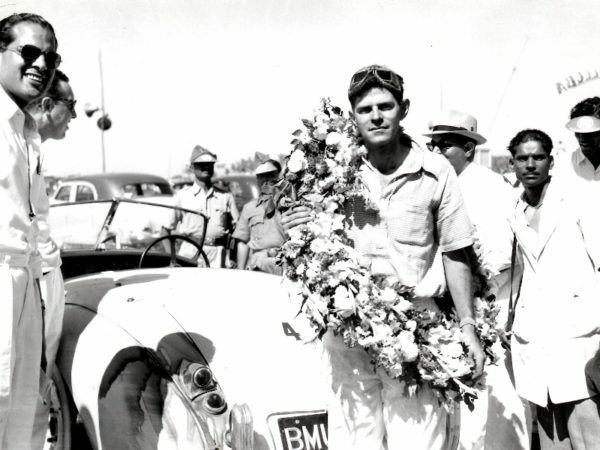 Our picture remembers Peter from his time in the Far East after the war, when he was working with Kodak in Bombay, after winning one of two races on the same day in a Jaguar XK120. It was in India, too, that Peter discovered a passion for classic cars, which developed in the late 1970’s into his owning two or three vintage models of his own, including a Rolls Royce Silver Ghost, built around the time of his birth. He became a dedicated member of the Veteran Car Club and of the Rolls-Royce Enthusiasts’ Club. Peter was a contributor to the SAHB Times and to Issue 11 of our annual ‘Aspects of Motoring History’ – where his article on the short-lived Pioneer Power Company and its steam vehicles demonstrated the breadth of his automotive interest and the depth of his research. But the achievement of which Peter was perhaps most proud was his assistance in the editing and publishing of the autobiography of S.C.H. ’Sammy’ Davis. We recall with great fondness Peter’s vitality, enthusiasm and impish sense of humour – perfectly illustrated by his presentation on the motoring cartoons of Punch at the SAHB autumn seminar in 2014. It was, as always, thoroughly researched, but it also had us in fits of laughter. The SAHB extends its deepest sympathy to Peter’s wife Jean and his children Simon and Catherine.